When the Kansas City Chiefs season ends, whether it be on tomorrow afternoon in Foxborough or after Super Bowl 50 next month, the Philadelphia Eagles will have a new head coach. 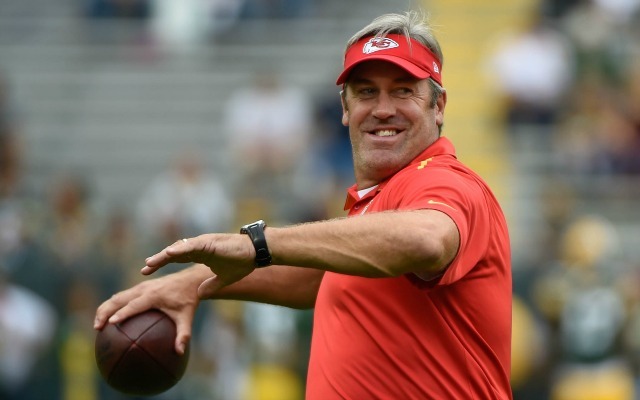 As broken by Les Bowen of the Philadelphia Daily News, the Eagles will hire Chiefs offensive coordinator Doug Pederson as their next head coach once their season concludes. The Eagles, of course, dumped Chip Kelly before Week 17. After a strong start to the Kelly era with back-to-back 10-6 campaigns, the Eagles slid backwards with a disappointing 6-10 campaign in 2015. Can Pederson get the Eagles back to winning ways? One of the reasons why the Eagles axed Kelly so early was so that they could get a jump-start on their coaching search as opposed to other teams that were waiting for Black Monday. Considering that, the Eagles did not have a particularly inspiring crop of candidates in the mix and ultimately, they did not make a particularly inspiring hire here. Pederson was, at best, the Eagles' third option as their next head coach, getting the job after Ben McAdoo got promoted by the Giants and Tom Coughlin removed his name from consideration in part due to McAdoo keeping much of Coughlin's staff intact. What also didn't hurt Pederson's case was Andy Reid lobbying owner Jeff Lurie to hire Pederson. It appears that the Eagles are looking to go back towards the Reid era with the two finalists being Reid protegees in Pederson and offensive coordinator Pat Shurmur who coached the Eagles in Week 17 (running backs coach Duce Staley was also interviewed for the job as well). There really isn't a whole lot of difference between the two other than that Shurmur was a disaster as head coach of the Browns from 2011 to 2012. Pederson has done nice work as the offensive coordinator these past few seasons with the Chiefs and particularly so this season as the Chiefs have gone 11-1, including their Wild Card win over the Texans, without Jamaal Charles. He also has a nice reputation of working with quarterbacks as Alex Smith has done well with him but let's be clear, that is Reid's offense. Pederson didn't start calling plays until this season. It looks like that this hiring signifies a desire to get as far away as possible from the Kelly tenure while going back to the Reid era. I don't think that Pederson is a bad coach and I think he could very well do a fine job with the Eagles. It just seems to me that the Eagles organization played this hire too safe.